The Fairmont Empress began her story as Victoria, British Columbia’s, most iconic hotel on January 20, 1908. Famed architect Francis Rattenbury was commissioned to design the hotel after his success in designing the new legislative buildings in the relatively new Canadian province of British Columbia. Fairmont Empress was meant to serve businesspeople and tourists, but after the Canadian Pacific Railway discontinued service to the area, it was successfully marketed as a resort. A star from her beginning, Fairmont Empress did not have a sign over the front entrance. When a sign was finally raised, one irate Victorian uttered the phrase, “Anyone who doesn’t know this is the Empress shouldn’t be staying here.” However, it would appear many did know and appreciate the Empress. Edward, Prince of Wales, danced in the Crystal Ballroom in 1919 with many local ladies, whose obituaries mentioned that night over 50 years after it happened. When reigning royals King George VI and Queen Elizabeth visited Victoria for the first time, they stayed at the Fairmont Empress. Over the years, HRH Queen Elizabeth II, Prince Philip, Prince Charles, and Camilla, Duchess of Cornwall, stayed at the hotel as well. Celebrities came to the hotel in droves. 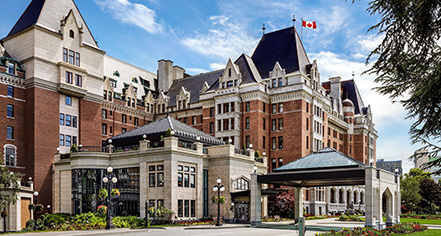 Stars like Rita Hayworth, Jack Benny, Roger Moore, Katharine Hepburn, John Travolta, Barbra Streisand, and Harrison Ford have passed through the Fairmont Empress' lobby. Shirley Temple came to stay in the 1930s after rumored threats of kidnapping. Her bodyguards stayed in the room across from hers and always kept their doors open. By 1965, the hotel had fallen on hard times; it was faded and dowdy, leaving officials to debate on whether or not the Fairmont Empress should be torn down to make room for something more modern. Thankfully, it was decided that the loss of the Empress was far too great. Instead, there was a $4 million renovation and refurbishment, the first of many. In 1989, $45 million was spent in what was dubbed the “Royal Restoration," which was also when the indoor pool, health club, and guest reception were added. In the midst of this restoration, it was discovered that the beautiful, Tiffany-style stained glass that makes up the roof of the Palm Court had been covered by wood. To this day, guests can now enjoy sparkling light on the shining marble floors during weddings and other special events. In the 1990s, the Willow Stream Spa was added and became Victoria’s most award winning spa to date. 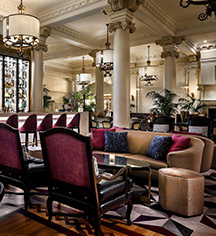 The most recent renovation, the Return of the Queen, has seen every part of the hotel updated for modern times while restoring and paying homage to the classic elements it bore in the 1910s.